Ideally, a concrete driveway will last the life of your home. But there are conditions that can shorten its lifespan and result in unsightly cracking, discoloration, settlement or scaling. 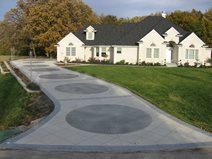 The typical causes of concrete driveway distress include an improperly compacted subgrade, the use of an inadequate concrete mix, exposure to severe weather conditions, or bad placement procedures. But rather than ripping out the concrete and starting over, you can often save money by repairing your driveway, as long as the concrete is structurally sound. Before beginning any driveway repair project, the first and most important step is to figure out what caused the damage and then determine the best repair procedure for solving the problem (read this troubleshooting advice). Depending on the condition of the concrete and your budget, your options for driveway repair range from a simple color enhancement by applying a coat of stain to total resurfacing with a decorative overlay. Concrete resurfacingIf your driveway is experiencing cracking, scaling or spalling, the best solution is to resurface it with a concrete overlay. Resurfacing will not only cover up the existing flaws, it will also upgrade the look of your driveway by allowing you to choose from a variety of color and pattern options. Before you can resurface existing concrete, it’s important to remove any unsound concrete and repair noticeable cracks so the overlay has a solid base to bond to. See this step-by-step overview of resurfacing a concrete driveway. Concrete engravingFor concrete with minor cracking or discoloration, you can completely disguise the flaws by engraving a pattern in the surface. Depending on the pattern you choose, the flaws in the concrete can actually contribute to the look. 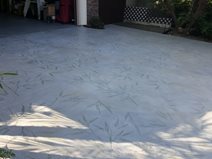 With engraving, the concrete is stained first and then a special routing machine is used to cut the pattern into the surface, creating faux grout lines. Learn more about the concrete engraving process. SlabjackingIf your driveway slab is sinking in spots, the problem is most likely due to a poorly compacted subgrade or soil erosion. With slabjacking, it’s possible raise the slab back to its original position by pumping a mixture of sand, cement, fly ash, and other additives beneath the slab. See this overview of how slabjacking can fix a sunken concrete driveway. RecoloringAlthough most concrete stains, color hardeners, integral pigments and other coloring methods are very long-lasting and wear-resistant, years of neglect can take a toll. 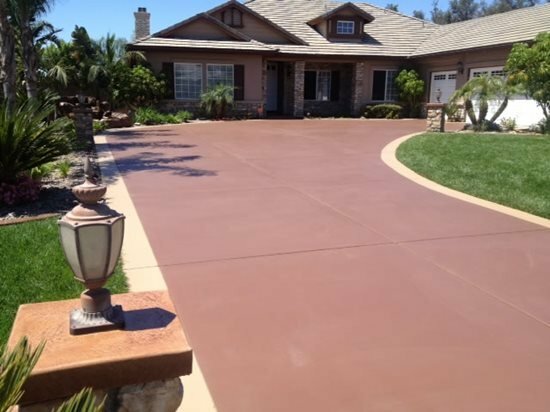 Discoloration of concrete driveways can be due to a number of causes including weathering, sun exposure, improper color application, and absorption of stubborn grease and oil stains. The good news is that in most cases the concrete color can be revived by applying a new coat of acid or water-based stain (see Changing the Color of Colored Concrete). By using a UV-resistant staining product and by protecting the concrete with a good sealer, your newly colored driveway should maintain its beauty for many years. Envision Concrete in Escondido, Calif.
A gardenful of bamboo plants was the inspiration for this concrete driveway overlay, which is stamped with a pattern of bamboo leaves over a light stone texture. Champney Concrete Finishing in Lynchburg, Va. When the stain began flaking away from this home’s long, winding concrete driveway, a decorative overlay with a circular tree motif gave it a complete transformation. This colored concrete driveway was streaked and faded due to weather exposure and improper maintenance. Water-based stains, in the colors of bark brown and light adobe, were used to revive the original color. Some homeowners think there is no hope for a driveway with deep cracks and crevices. But sometimes the solution is simple and can have stunning results. 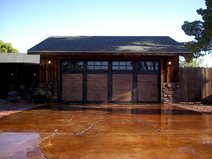 On this project, the concrete driveway was stained a warm walnut tone to accentuate the existing cracks and give it a rich leather-like appearance. 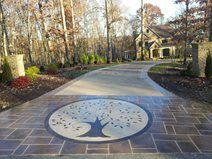 This existing driveway was transformed with color and engraved patterns, including seven brick-patterned circles.